A foursome of Swedish boy-band-lookalike cops, on their way to a performance of Les Miserables, became instant celebrities when they separated two men fighting on the New York subway. “We came here for vacation; we’ve been here one day. We’re no heroes, just tourists,” 25-year-old rookie Uppsala policeman Marcus Asberg told the NY Post. The four men noticed that a whole train carriage of uncomfortable New Yorkers rapidly emptied at Bleecker Street Station. As they entered it, they saw one apparently-homeless man beating up another. “We thought maybe someone needed help,” said Samuel Kvarzell, 25, from Stockholm’s Police Department. “One of the guys was on top of the other guy, so we separated them,” said Asberg. 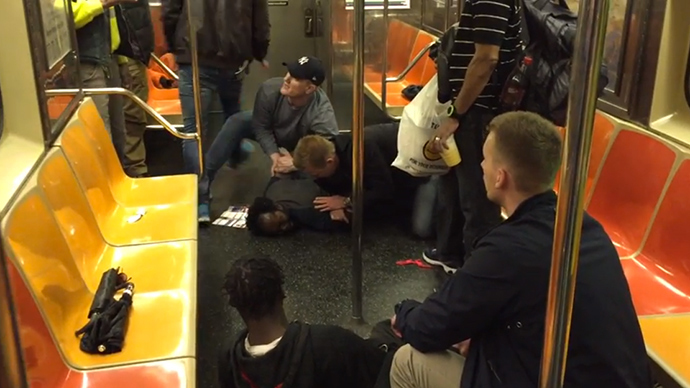 As a crowd of onlookers gathered, the out-of-town cops kept the public under control and provided first aid to the victim until the NYPD arrived. The four arrived on time for the start of the award-winning musical about 19th century France, and after producers found out about the incident, the young men were offered a backstage tour. The NYPD also contacted the four to present them with a gift to commemorate their selfless act. But one person remained nonplussed at the fuss over the tall, muscular Norsemen. Kvarzell’s Stockholm colleague Kia Samrell says she’s been flooded by calls from all over the world asking about how he grew up to became this week’s subway hero.